I arrived nice and early at Dovedale car park around 7.00am, planning to avoid the crowds as the forecast was good, and with it being a Sunday I knew the walkers would be out in their droves around lunchtime. After crossing the wooden bridge into the first valley, things were very quiet indeed so I took a few pictures, its a rarity to get them without walkers scattered all over the background. Her Majesty (Dove) was in fine form and running very clear and very appealing to any game fisher. I chose my 9ft Sage today, as I had already decided to wear my chest waders so I could access anywhere I like, and although heavy nymphs were the order of the day, I thought I'd leave the 10ft rod resting at home today. There was a little insect life today during the bright spells, I definitely spotted a couple of upwings, which is probably what tempted the fish to rise here and there. I had to endure a hail storm, which soon passed and did nothing to deter my spring feeling inside. I netted a couple of grayling and lost a real monster around the 3lb mark, it came off about 15ft away, but not before flicking his huge dorsal at me - this would have been my personal best without a doubt, but like a mentor/friend of mine always says "its character building." I know where that big lad lives now, so I can give him a knock in the near future. I had a few trout today and believe me, they are switched on for sure - resulting in ferocious takes and some real head banging. I took a couple of trout pics myself, and one kind passer by, offered to take one of me holding a nice brownie - pictured below. I met another brother of the wangle today called Dave, he drives all the way from Northhampton to fish Dovedale, which speaks volumes about how high the quality of fishing must be. We both had a chat and swapped a few tales, and he explained how a grayling 2ft long showed itself while taking something off the top. Look at the tail on this trout below in proportion to its body size, needless to say it packed a real punch, with a propeller like that it was born to run, and a few times at that. The bigman below holding a specimen brown - and his biggest one for a while, yet again it appeared much bigger in the flesh, but Shrek made it look smaller! On the whole it was an enjoyable day with interchangable weather, I endured hale, rain, cloudy, clear and sunny enough for the Captain to say "your face looks all red" when I got home. I started around the wier as always, and tried bumbling some heavy check nymphs along the bottom of the faster runs. I hooked into a fish which gave a good old tussle, resulting in the trout pictured below, which was long and lean and ready to fatten itself up through spring. I apologise now for the picture quality, as I forgot my camera so had to use my phone for the first time, this was a real scary ordeal, a toss up between possibly crushing the phone with my bare hands or dropping it in the river, luckily neither became a reality. After a short while an old chap turned up with a big bag of maggots and the challenge was set, maggot vs fly which was a battle I'd lost before many times. I began to wade downstream check nymphing and so the fun started, I took 3 grayling in succession, one of which was a finer grayling as any I've caught this year, the grayling are always spectacular from this stretch and never disappoint. Needless to say I had to use my phone to take the picture below, and I remember thinking "oh well thats probably as big as I'll get today, so hopefully I wont have to get it out again." I finished the day on 6 grayling and 2 trout, which isn't a bad ratio for grayling season, especially as spring is in the air and the trout are starting to grab all they can after surviving on rations through the winter. At the end of the session I met the old chap at the check in station, where he told me his red maggots had caught him 11 superb grayling, but he was a friendly old chap so losing the challenge was easy to swallow, especially after he bigged up my results on the fly. I fished the Derwent at Willersley Castle this afternoon and on arrival the car park was full, fortunately a fisherman had just finished and after telling me there were 6 chaps baitfishing, I parked in his spot while deciding wether to change venues. I decided to give it a go as I only had the afternoon so what the hell, I took my 10ft rod and nymph line and off I went. The fishing was slow at first but I decided to use my chest waders to their full advantage and as all bait fishers didn't have waders, I stuck to the far banks and deepish water. It wasn't long before I had caught 2 specimen trout and a few grayling, so my day was complete already. This beauty below proved difficult to get a picture due to the close range of one hand to the other, mind you it was a real clunker. I slowly made my way upstream picking of the odd fish, mostly in the tail ends of the pools, until eventually I reached the wier. I sat on the island and boiled up my kelly kettle to make a fresh cup of Ringtons tea, and boy did I enjoy it. On reflection today was one of my most enjoyable days throughout winter considering how things started, and Willersley Castle remains one of my favourite venues to fish to date. Totally refreshed I then managed a couple more trout and a few grayling from around the wier area, including these 2 grayling below, one of which just wouldn't stay still. My damn hands are so big they don't do any of these fish the justice they deserve, but to give you some idea of my shovels, my own kids call me shrek! I swear this grayling below turned, looked me in the eye and said thanks for being delicate, before releasing him back into the Derwent. 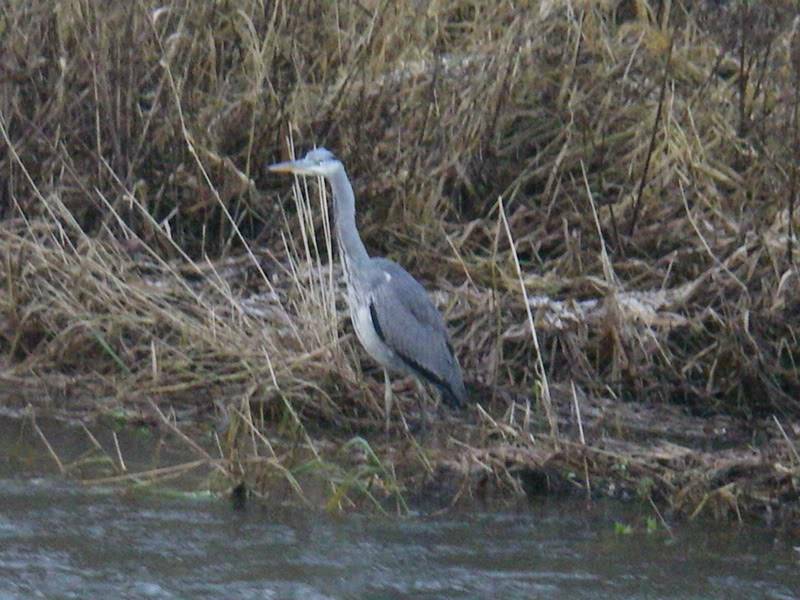 Today I fished the Churnet at Oakamoor, which proved a very interesting day - starting with this beauty pictured below. This is the infamous Egg Box (incubation box), used to restock the river by placing trout eggs in the bottom with a layer of gravel on top. Water is running through the box constantly, courtesy of the green pipe attached with some sort of flow regulator. When the eggs hatch they feed off their own yolk sack at first, but then they go searching up through the gravel to the light, in search of food. They then get sucked out of the outlet pipes - drop into the gutter leading them into a small oasis, which runs a short distance before reaching the river. If you're really patient you can see them sliding down the gutter into the stream which was truly fascinating for me. Now for the fishing, the first thing that strikes you is the brown tinge to the water, which I'm told is not unusual for the Churnet, especially after serious flooding. It wasn't long before I started to imagine the sound of banjo's as I slowly followed the winding river into the wilderness. Peace and tranquility is reached instantly, even before Eastwall Farm is out of sight the silence really strikes you, so finding the zone was really easy. I thoroughly enjoyed my days fishing, and although no grayling showed, I would imagine the trout fishing in summer is spectacular. I have spoken to LADFFA members who tend to avoid this venue out of trout season, but I couldn't wait that long to explore this stretch of the Churnet, I fancied a new venue today and at least I'm better prepared for next time - in the spring. I used a 9ft rod and managed fine, but I wouldn't recommend anything longer than that, anything shorter (7-9ft) would be fine. 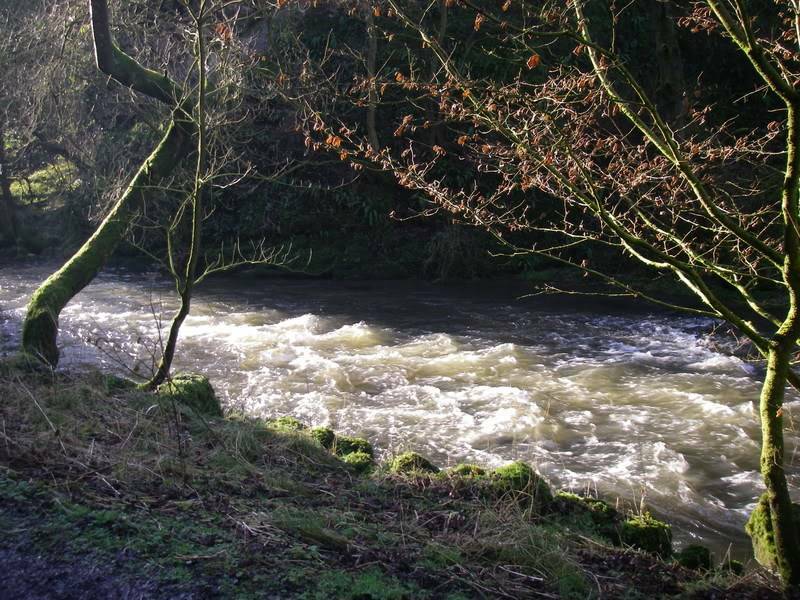 Although the banks are very high in places, there are many places to get in and out of the river. 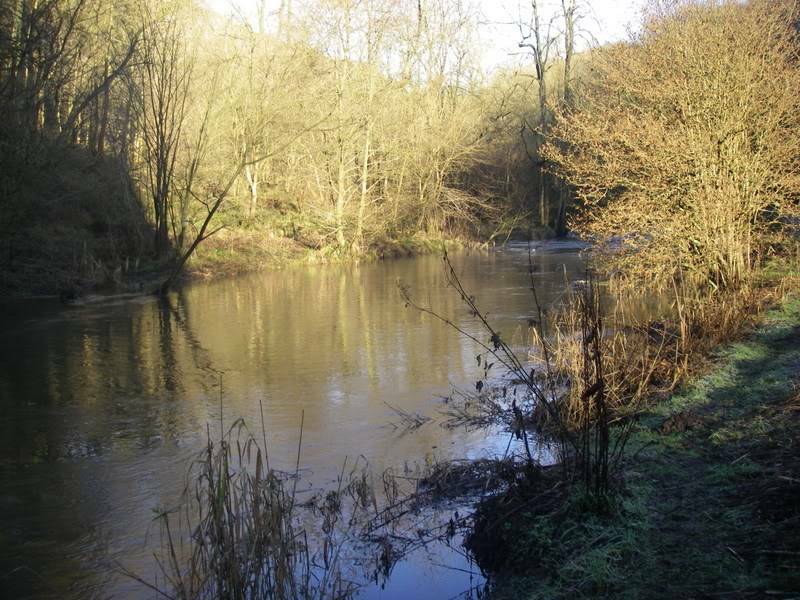 I should also mention that you will definately need waders to cross over banks at certain spots, and also to get into prefered positions, that's if you want to get the best from fishing the Churnet. 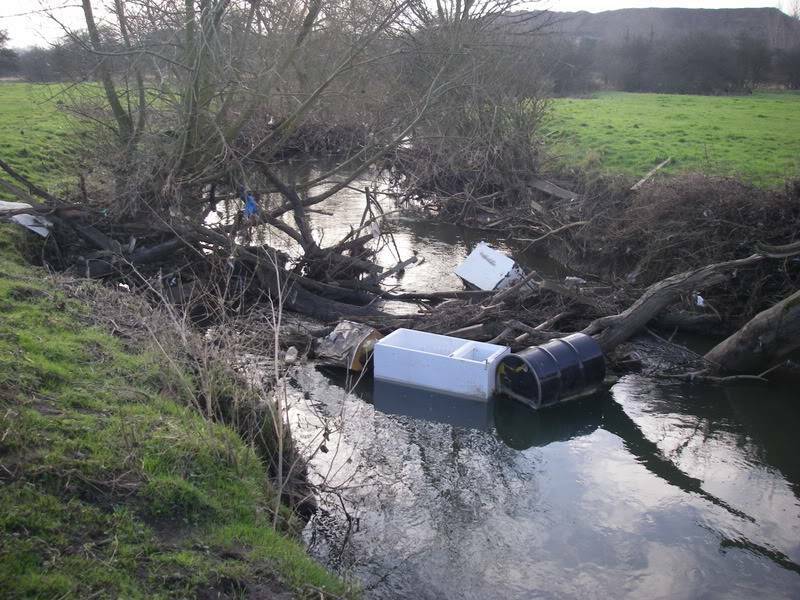 A good way down the stretch, a chunk of bank containing a tree had fallen across the river and created a damn of LWD (large woody debris) with only a little waste (plastic bags and bottles). This Damn seriously killed the flow of the river, and the silt seemed to be settling downstream of it, although I'm no expert, I think it will need addressing so I'll contact someone at LADFFA. Roll on summer, as with plenty of upwings on the breeze, this stretch could be close to paradise for me. The kids were at their Grandparents today, so me and the Captain (wife) decided to take the walk from Milldale to Dovedale, especially as the forecast was cold, clear and bright, just how I like it. Needless to say, after I explained how a few casts here and there during the walk wouldn't take much longer, we soon set off with me carrying my 10ft rod, and the Captain a smelly landing net. The Dove always looks spectacular during heavy frosts and below is the proof, so with the river running clear and very few walkers about, I was certain to impress the Captain with my fly fishing skills. Now the reality was, I never felt a pull, tug, twitch or knock all day long, although I did recieve lots of resistance from large boulders and underwater snags, one bonus is I've found a name for my latest grayling flies, Tree Magnets. I must have snagged almost every tree along the stretch which cost me at least a dozen flies and the only fish I saw all day, were 2 large grayling lying under a tree, so I quickly set about stalking them. This peg cost me 3 more flies on the same damn tree, and although the Captain had shown great strength and resilliance all day, she just couldn't contain her laughter any longer. She tried to console me between belly laughs by saying "well those flies don't cost much to make do they?" totally bypassing the fact I had to endure below zero temperatures for hours in my shed, tediously tying them with all the passion of a female flamenco dancer. Just to end on a positive note we did get a welcome visit from a plump robin who followed us downstream for a while, and the Dippers were busy diving without neoprenes or thermals - the mad boggers, just another day at the mill for them I suppose. After saying all this the day was not wasted as we had a lovely peaceful day without any children and filled the riverbank with laughter, and afterall I could think of worse places to spend a day. I am left wondering where all those lovely grayling have gone though. A Perfect morning for grayling fishing in my opinion with a hard frost, with a bright clear sunny day to boot. The Dove was running very clear and wading right from the wier downstream to the bridge seemed possible today, so I guess the river was at a good level. I fished around the wier for the first hour but with no success, so I decided to wade down to the bridge. Bingo! I was into a nice grayling caught with a Tiny Shiny, this fish gave me a teriffic fight, then taking a photo with one hand while holding a fish in the other was tricky, and considering I was up to my belly button in icy cold water, they turned out quite well. I managed a couple more grayling, one caught with a pink shrimp, and all fish of a similar stamp and excellent condition. I saw no hatches of anything but I noticed a couple of rises late afternoon, so could'nt resist trying my new floating line, by running a Klinkhammer through the swim, sadly this was wishful thinking on my part and due to cold feet, I decided to call it a day. Me and Del walked the Erewash today armed with a white tray, bucket, magnifying glass, turkey baster, camera, fine mesh landing net and our chest waders. Our intentions were to take kick samples above and below all inlets to the river and along its length, paying special attention to the sewerage plant. The kick sample is a method of checking the health of the river by checking what invertabrates are lying in the river bed - this is done by scraping the gravel on the riverbed with your feet, while holding your net downstream to catch everything being thrown up by the disturbance, especially any creepy crawlies. Then tip the contents of the net onto a white tray for inspection, using a baster and a magnifying glass you inspect for any signs of life. Below are some pictures of our findings all of which were found in numbers. All the above point towards a healthy river system so its fingers crossed until a team from the EA turn up. They will give there opinion on the possibilities or the Erewash being restored to a great trout stream once again. I decided to fish the Churnet this afternoon for a few hours, and after arriving at the Ramblers Retreat around 1pm, I set up s.a.p knowing my time was limited to 3-4 hours. I walked downstream along the bank for a while, until I felt I'd left enough river to use my time up fishing my way back, probably about half of the stretch I guess. I clambered down the steep bank into the river at which point I should mention that the top sections have high banks, and some careful navigation is on the menu. Upstream nymphing with a little check nymphing were the obvious methods, so after so long I set off back upstream towards the Ramblers Retreat (picture below) which I'm told serves excellent food, so maybe on a full day in summer I'll get the opportunity to fill my hodge and get back to you about that. The Churnet was a little coloured but looking in fine fettle, apart from the odd chunk of bank erosion, obviously due to recent flooding which had also created loads of large woody debris, which the fish would always appreciate. A Collapsed tree lay across the river at one point and this proved very tricky to clamber over, but with high banks it was decision time, forward march or retreat, which wasn't really an option for a stubborn git like me. I used my 10ft rod today which occasionally got tangled in the overhead trees, this rod proved difficult to use but you live and learn by your mistakes, so its a shorter rod next time for sure. No grayling today I'm afraid but I managed a few hungry little trout, who might have been tricked into thinking it was spring as it was such a glorious day. I wonder if this wonerful fish originated from one of the incubation box's (Egg Box project) an adopted method of restocking on the Churnet 5 yrs ago by LADFFA, although the Lords Bridge stretch is not stocked trout move around in rivers - check there website for info on the egg box experiment. I couldn't resist a quick picture of this little beauty below, just to prove what a great success story the Churnet really is, after being heavily polluted it is truly re-born. There should be some proud chaps some where, responsible for bringing this lovely trout river to life, and I will be back come spring/summer for more of these little stunners. Setting off home, and driving alongside the river, I noticed the lower stretches looked more suitable for holding grayling, maybe I'll start at the bottom next time. To describe the location of this stretch of the Churnet as in the village of Alton, next to Alton Towers is very misleading, and is like describing Blackpool as an atol in the Maldives. Today I took my first walk along a stretch of the Erewash river with a mind to explore the possobilities of restoring the river to former glories. 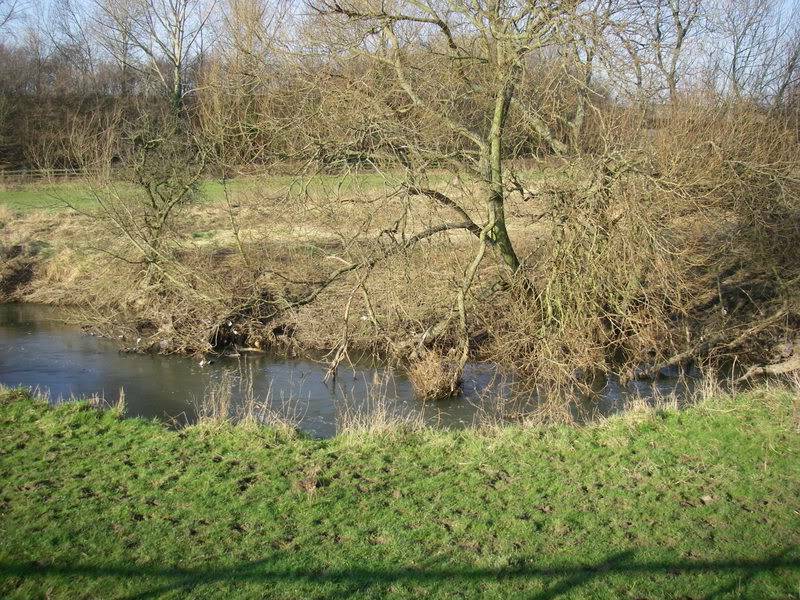 The River Erewash Restoration Project is about a group of fly fishermen who have decided to join hands to try and bring about, the return of a succesful trout stream. We intend to walk the different stretches hopefully to find any suitable spots to restore, if there are any that is. I took my camera along with Biscuit and Cookie (dogs) for a walk from Moorbridge Lane to the Severn Trent works at Trowell, which takes roughly around 30 mins each way, with a few stops to investigate. 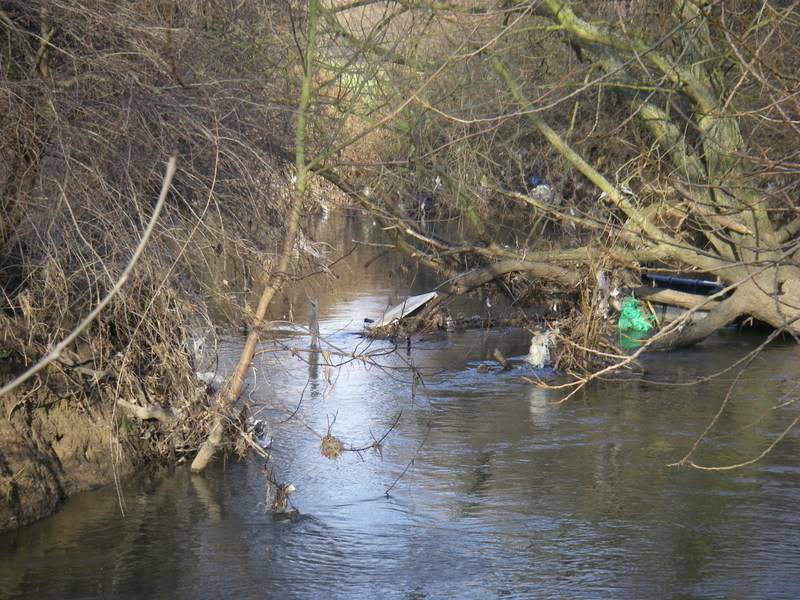 The river has just been in flood so the water is coloured and there is plenty of debris scattered along the banks, and caught up in the trees. I took pictures while walking to show the group the present condition which is shown in the pictures below, and no doubt we have our work cut out. I decided on dovedale today along with every other walker in the UK , which made fishing slightly difficult. I would usually avoid this venue at the weekends, especially in summer. On arrival the river was high and coloured but the show must go on, especially as tomorrow's forecast is heavy rain and today the sun was shining bright, in a clear blue sky. I set up my 10ft rod and set off along the banks of the Dove, before long I managed a grayling in superb condition but small in size. The hard work was now done as one fish is always enough for me, anymore are a bonus after that and I tend to relax with no pressure on, once I've wet my net. I caught 2 small grayling and lost a couple of big ones too, with all takes on a Pink Shrimp pattern. Wondering downstream I came across a real fisherman (pictured below), who happily took part in a mexican stand off with me from the other side of the river. Usually these birds move along whenever you get close, a bit like chasing a £10 note in a gale, whenever you try to pick it up - off it blows again. There was no doubt this was the Clint Eastwood of the fishing world, and not only was he there first, but he was also fishing for his dinner, while I know my evening meal will be placed on a table in front of me, by my darling wife.